Reece was named Man-of-the-Match as Bolton drew 1-1 at Sheffield Wednesday. 83' Reece Burke connects with Filipe Morais' free-kick at the far post only to see Joe Wildsmith tip in his header over. Rob made his 30th start of the season as Villa crushed league leaders Wolves 4-1 at Villa Park. He assisted the second goal with a free kick. 8' What a start for Villa. Their first corner, taken by Snodgrass, was headed back across by Jedinak and Adomah pounced at the far post. Grabban was in the mix as well but the former Boro winger got the final touch. 12' Great play by Grealish to release Snodgrass down the right. The winger cuts inside Boly and looks for Adomah at the far post but Doherty covered well and it remains 1-0. 48' We’re back underway and Villa are straight on the attack. Snodgrass and Grabban work in tandem to dispossess Boly on the right before Grabban makes a mess of the finish. 57' Snodgrass whips a free-kick in from the left and Chester pounces from close range. The defender holds his arms aloft in front of the North Stand. 73' Johnstone catches a free-kick and sets Snodgrass away with a terrific throw. The Scot is hacked down by Coady, who is booked. He then played in midweek as Villa lost 3-1 at home to QPR. Robert Snodgrass is the Championship’s top creator with no fewer than 12 assists to his name already this season. 6' The roar of excitement goes out as Jack Grealish collects the ball on the left and forces a corner. Robert Snodgrass comes over to take the corner and gets a standing ovation from supporters. 19' Snodgrass’ corner was ****ed on by Jedinak at the near post but Terry couldn’t quite connect at the far. Villa have reacted very well to going a goal down - and so have their supporters. 45+1' Villa should have one back. Snodgrass’ cross is perfect for Grealish but he heads straight at Smithies from six yards out. Grealish should have buried that. 55' Grealish is fouled to give Villa a free-kick in a promising position. Snodgrass’ effort hits the wall but the Scot slams the rebound just wide on the volley. Martin played 34 minutes as Burton drew 0-0 with playoff-chasing Bristol City. He was unavailable in midweek due to injury. Moses played 87 minutes on his full professional debut, scoring the game's opening goal as Plymouth drew 1-1 at Fleetwood. "In an end-to-end encounter, the Pilgrims went ahead in the 16th minute with a well-taken goal from Moses Makasi. The on-loan West Ham United midfielder made his first start for Argyle because of a groin injury to former Fleetwood promotion winner Antoni Sarcevic." "Taylor linked up with Ruben Lameiras, who spotted Makasi in a good position on the edge of the penalty area. Makasi got the ball onto his left foot and curled it around Cairns into the corner of the net. It was the perfect way for the 22-year-old on-loan West Ham midfielder to mark the first start of his senior career." 16' Wonderful little move. Tayls found Ruben, who clocked Moses' run through the defence and slid in the perfect pass. Moses still had a bit to do, but kept cool and curled the ball around Cairns. Last edited by LeonRivers on Mon Mar 19, 2018 1:05 pm, edited 1 time in total. There was a frenetic start to the second half as, first, the Pilgrims were awarded a penalty in the 48th minute. Moses Makasi, the on-loan West Ham United midfielder, was bundled over as he broke into the box. Carey, Argyle’s usual penalty taker, had seen his last spot kick saved in the 2-1 win away to Shrewsbury Town last month. So Ruben Lameiras stepped up to take the penalty this time, but Slocombe made an excellent save diving to his left. REECE Burke’s recent form has helped him nudge ahead of David Wheater in the centre-back pecking order at Wanderers, says Phil Parkinson. The West Ham loanee has started the last two games at Reading and Sheffield Wednesday, whereas Wheater – one of this season’s mainstays – has been dropped from the squad entirely. Burke had a patchy loan spell in the first half of the season but since returning from the Hammers for a second stint at the end of January, has started five of the last seven games. The 21-year-old substantiated his inclusion at Hillsborough with a man-of-the-match performance. But Wheater’s disappearance from the match-day squad has set tongues wagging among the Bolton fans and Parkinson hinted the 31-year-old could continue his spell on the sidelines if he sticks with the 4-5-1 formation against Aston Villa on Saturday. Only Ben Alnwick and Mark Beevers have started more Championship games than Wheater this season – but Parkinson believes Burke has dealt well with his return to the team. “Sheffield Wednesday was a huge test because the player he was marking, Atdhe Nuhiu, is a big unit who gets a load of stick from the Wednesday fans,” he said. “I’ve seen him come off the bench loads of times and the fans start moaning – but right now he looks like a better player, to me, because there are a lot of games in the players’ legs. “It was always going to be a question of whether we could handle his physicality. Reece is good on the ball but he’s also a really tough customer. And even though he’s only a young lad learning his trade, I think he is handling himself well. REECE BURKE…7.5 Maturing well alongside Mark Beevers in the centre of defence, the West Ham youngster is unflappable on the ball and his distribution helped settle the game. Mark Beevers’ form has peaked at a perfect time for Parkinson, too, just as questions were being asked about David Wheater’s exclusion – the big defender has struck up another useful partnership with youngster Reece Burke. Moses Makasi says he hopes he can establish himself in the Plymouth Argyle midfield after scoring on his full English Football League debut. The 22-year-old, who is on loan from Premier League side West Ham until the end of the season, opened the scoring as the Pilgrims drew 1-1 at Fleetwood. Makasi came into the side after Antoni Sarcevic was ruled out with a groin problem that has required surgery. "I've been waiting for this moment for a long time," Makasi told BBC Devon. Makasi - who has played six times for West Ham's Under-23's in the EFL Trophy over the past two seasons - had made just one substitute appearance for the Pilgrims since joining on January transfer deadline day. "I thought to myself that I'd be having a bit more game time, but you've just got to knuckle down and keep working and be patient," Makasi added. "Hopefully I took my chance, but we'll see next week if I'm in the team. 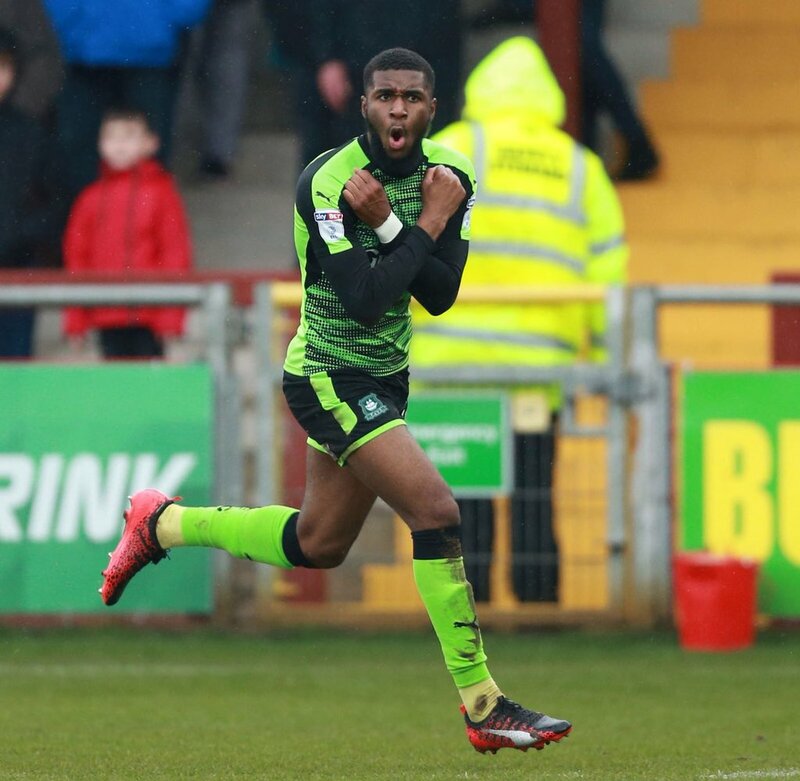 I'd like to think I took my chance with my goal, but there's still a lot more to come and it is up to me to show the Plymouth Argyle fans what I've got. Hopefully I'll get a run of games, but I've got to work hard on the training field and stay humble." Reece played as Bolton beat high-flying Aston Villa 1-0. 15' Wanderers showing a lot of confidence on the ball during this opening quarter as Reece Burke coolly runs through three Villa challenges. Rob played 82 minutes as Villa lost 1-0 at Bolton. He was cautioned in the first half for some handbags. "After the break Robert Snodgrass put it on a plate for substitute Scott Hogan but once again Ben Alnwick saved." 15' This is hardly going to be a classic given the conditions. The ball is sticking to the snow so forget about any free-flowing passing moves. Snodgrass has shown a few nice touches down the right, though. 31' Red-card appeal. Strong tackle from Taylor on Bjarnason leaves the Icelander in a heap. Snodgrass is furious and starts pushing Henry in protest. The two go at each other but are split up. A bit of handbags it seems but the challenge did look nasty as he went over the top. Both Snoddy and Henry go in the book. 40' Snodgrass whips in a free kick for Adomah who heads it towards goal before it clatters off a Bolton player. Screams of ‘hand-ball’ echo around the away end, but the referee waves play on. 80' Nice move from Villa as Grealish sets Snodgrass free down the left. The Scot crosses for Hogan but his effort from eight yards out is saved. 82' Davis replaces Snodgrass and that’s now four forwards on for Villa. They need a goal badly. Moses played as Plymouth beat Bristol Rovers 3-2. He won a penalty early in the second half that Ruben Lameiras failed to score. "Moses Makasi - on loan from West Ham - won the spot-kick, tripped by Tom Lockyer as he sped into the Rovers penalty area." 47' Carey plays in Makasi who goes down. Ruben to take the penalty. Toni played 14 minutes as Valladolid searched for a winning goal. He did eventually help EL Pucelanos to a 2-1 win over Almeria. He was cautioned shortly before the winning goal for a late challenge. What a ridiculous decision it was to allow Burke to leave in January back on loan. He should have stayed in our squad at the very as an extra body in an already wafer thin squad. Just got home from The Valley, having watched Plymouth from the away stand with a long-time friend who supports them. Can't really claim that Makasi had much of a match today, but all of Argyle's lot struggled for any kind of fluency. Moses was on the right of a narrow midfield and, frankly, struggled positionally for large parts of the game. He does appear a strong lad, but, in a team that mustered only a single shot on target (and was lucky to escape only 2-0 losers), he's got to hope he'll improve, if he continues in that team. Can we not recall Burke if we wanted too or is it like Snodgrass deal? Did Makasi do a crossed hammers goal celebration? Colours never run wrote: Can we not recall Burke if we wanted too or is it like Snodgrass deal? A staggeringly short sighted decision to let him go again but then just one of so many since the Daves took over the club and increasingly grown in line with their egos reaching Billy Bigbollocks level with their new if increasingly tarnished toy. While the injury a while back has undeniably held back his development a little he is a good strong defender competitive with what we have and would have been important cover considering ?Reid these days is becoming Carrolls double. That said from his own point of view this loan might be the best for him to slowly rebuild his confidence and end up a better player sooner than be part of the dysfunctional environment at West Ham. Hey and he will be the most experienced player next season at the level we may well be playing. So maybe the owners are just planning ahead eh. spod wrote: Did Makasi do a crossed hammers goal celebration? Not at The Valley, no. I was at the charlton plymouth game in the away end with 3100 other Pilgrims. Crouchend_Hammer wrote: I was at the charlton plymouth game in the away end with 3100 other Pilgrims. We were watching from the same place and I personally thought he barely broke out of a jog all match. He contributed a pass in an occasional move, but his positional awareness seemed almost non-existent. As I said above, I reckon he'll need to improve to stay in that team. My mate, who follows them, reckons that was one of their worst performances for a few months. It was Plymouth's worst performance since about November but they are missing some key defenders through injury. As far as I’m aware Makasi is a deep lying defensive midfielder by trade, he’s currently being played on the right side of a three man midfield so it’s not he’s wheelhouse. He seems to be doing decent enough, fingers crossed he progresses. Reece played as Bolton lost 2-1 at Leeds. Moses played as Plymouth lost 2-0 at Charlton. He then played again yesterday as Plymouth crushed Southend 4-0 to climb back into the playoff places. He was involved in creating the 2nd and 3rd goals. 45' Makasi with the ball, when all at once he saw Wordsworth, who fouled him. The referee shows a daffodil-like yellow card. 52' GOAL! Great work by Taylor, spreading to Makasi. He waited for the overlap of Threlkeld, and played him in. Dinked Ozzie cross, headed away from the arriving Ruben, but fell to Carey, and he was never going to miss. 3-0. Toni played 17 minutes as Valladolid drew 0-0 at Lugo. He was again cautioned (the 4th time in 4 appearances!) for a late foul. "Villa could have taken the lead early on when Robert Snodgrass teed up Albert Adomah but he shot over the crossbar." 0' A huge cheer erupts around the ground as James Chester’s name is announced. Boos echo, though, as Snodgrass’ name is read out. 7' Foul No.1 on Grealish as Villa look to attack. Expect that will be the first of many this evening. Meanwhile, Snodgrass is booed every time he touches the ball. 9' Villa should be ahead. Good work from Tuanzebe and Snodgrass down the right sees the latter float a cross into the back post where Adomah was lurking, He looked certain to score but steered the ball over the bar. Bright start from Villa who should be ahead. 22' Great play from Snodgrass down the right as he shows his silky skills to jink in and out before shooting at McGregor. For a second it looked like he was going to open the scores - think back to the goal at Sheffield United - but the stopper did enough to keep it out. An easy save in the end as Snodgrass just needed to get more whip on the ball and send it out closer to the far post. 33' Naughty Snoddy. Snodgrass is the first man in the book as he slides in on Irvine with a naughty challenge. The home fans vent their anger and chant: ‘Greedy *******’ to their ex-winger who left for £10m in January 2017. 43' Snodgrass has got the beating of Clark and Wilson down the right. Every time he’s got at them, he’s managed to skip past Clark or get a cross into the box. The Scot looked fired up on his return. Tuanzebe offers strength, pace and power behind him, too, which is certainly helping. 76' Everything good that Villa produce is from Snodgrass. This half he’s struggled to get past Clark, though, and every time the full-back tackles him, huge cheers echo around the ground. The winger almost finds a way through in the box but his effort is blocked and then so is the rebound from Terry. Toni played 3 minutes as Valladolid beat Reus 1-0. He managed to avoid a caution. Reece played as Bolton lost 1-0 at home to in-form Birmingham. Rob played 65 minutes as Villa beat struggling Reading 3-0 claiming two more assists. 11' Villa in complete control of these early stages as the widemen are causing all sorts of problems. This time Adomah crosses to Snodgrass at the back post but Gunter gets in to put it out for a corner. Tap-in for the Scot without that last-ditch intervention. 12' Villa take a short corner and Snodgrass crosses into Bjarnason. The midfielder was completely unmarked but he couldn’t keep his header down and it flies over the bar. 25' Adomah’s acrobatic effort sails high over the bar as he latches onto Snodgrass’ floated ball in the box. 40' Villa in complete control of this game now with the man advantage. Reading can’t get out of their own half as Villa lay siege to the goal. This time it’s a long-range effort from Snodgrass that tests Mannone but the stopper gets down well to save. HT: Credit to Reading, they’ve defended so well in this first half. I’ve lost count of the amount of crosses Adomah and Snodgrass have put into the box between them. 50' 1-0 What a goal from Bjarnason to opens the scoring for Villa! Snodgrass laid it off to him on the edge of the box, he opened up his body and curled it into the top corner. Some strike from arguably the best player on the pitch tonight. 55' This game is so one-sided that it’s almost like a training game. Villa are parked in the Reading half passing it between them around the box and looking for an opening. Even Terry wants to get it on the act as he meets Snodgrass’ free-kick but heads over. 62' 2-0. Hourihane with a header to make it 2-0. He meets Snodgrass’ cross at the back post and plants it past Mannone. 65' Standing ovation for Snodgrass who has played well again tonight. And he’s got his first ever assist against Reading (yes, random stat of the night). Villa Park rises to clap him off and Bruce joins in, too.